Contractors, subcontractors, property owners, and developers are encouraged to contact William B. Hanley to schedule a free initial consultation regarding your construction-related legal matter. Construction cases are an extremely complex form of litigation. Essentially, the complexity arises due to the multiple parties involved in any construction project. Each link in the production chain adds layers of complexity as well the possibility of potential conflicts. If you are faced with a lawsuit concerning a construction defect, you need an attorney who is thoroughly familiar with all aspects of the construction industry. Contracts are endemic as causes of conflict within the construction industry as almost every stage of the construction process is regulated by an agreement of some sort. Some of the areas of contract dispute include breach of contract in contract clause interpretation, inspection of work clauses, indemnity clauses, payment of supplies, and liability to third parties. If you are facing action regarding construction defects, contact Bill Hanley for efficient resolution. Buying a new home or business property often requires detailed investigation of the quality and former upkeep of the building. Many clients require assistance in or education on what to expect in construction law, which is why it is important to hire experienced legal representation to help protect from potential future financial loss. There can be other issues such as a landscaper improperly designing the building or the building resting on a faulty foundation. Repairing construction defects can amount to expensive bills, especially after buying a home or a new property for your business. 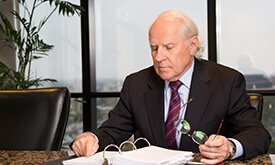 William B. Hanley has more than 35 years of experience representing clients who have run into issues and problems with their property due to construction defects. He is efficient with handling cases requiring litigation or mediation and works closely with each client to ensure the best possible outcome for each case. Contact him today for a case evaluation and to determine what steps you can take after a construction company performs faulty work for your home or business.